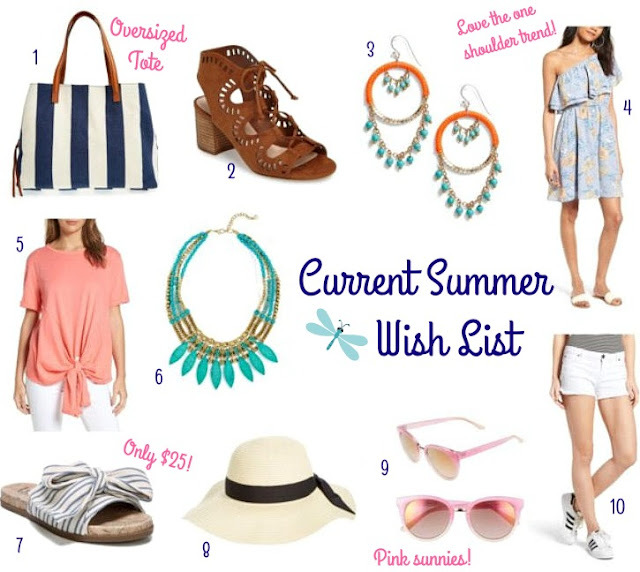 I thought it would be fun to put together a summer wish list of items I've had my eye on lately! 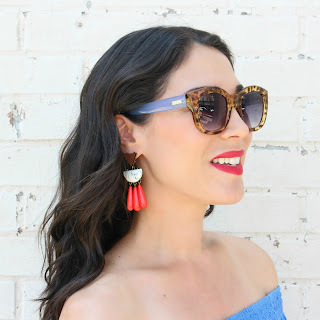 There are so many fun + girly trends this summer like bows, ties, tassels, beads, etc. I'm also loving raw hem denim and one shoulder dresses/tops! All of these items are perfect for summer vacations, too. Since I'm in my last few weeks of pregnancy, I've obviously been very limited with clothing shopping. I am SO ready to wear non maternity and to get my feet back in my favorite sandals and wedges (gotta love swelling)! LOL. Anyway, I wanted to let you guys know about these stylish and affordable items while they're available. Hopefully it makes your summer shopping a little easier! I love the navy/white stripes and this tote is SO roomy (can double as a baby bag!). I've had my eye on these for months...maybe after baby arrives! These are so pretty. I adore the color combo! This dress is adorable for date night, girls night out, graduations, baby/bridal showers and more! Looks so comfy and the front tie is really cute. Turquoise is one of my favorite colors during the summer months! Absolutely love the bows and these are really practical for me! A straw hat is a necessity for beach/pool days! I've been craving pink sunnies lately. Can't wait to get a pair of white denim shorts this summer. The raw hem is really fun for a change, too! Also, have you entered my JORD Watch Giveaway!? There's still time to enter for your chance to win $100 off one of their gorgeous wooden watches. Click here to enter! That is an excellent selection and I would love to have that pink top.